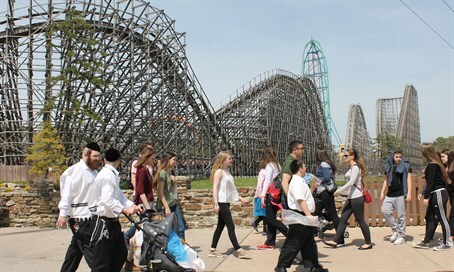 Thousands of observant Jews flock to Six Flags Great Adventure, in an annual Passover pilgrimage. JACKSON, N.J. (JTA) – Pinchas Cohen spent most of Monday wandering around Six Flags Great Adventure under a blazing sun, wearing a knee-length black coat and carrying a big box of shmura matzah under his arm. Passover at Great Adventure, a mainstay since 1983, is also the year’s biggest fundraiser of the year for NCSY's New Jersey chapter, which usually raises more than $100,000 after expenses. NCSY buys tickets in bulk and resells them for 30 percent off regular admission price, markets the program, organizes busing to the park and coordinates with park administrators to accommodate Orthodox needs. The park offers kosher-for-Passover food concessions, and NCSY puts on a concert featuring a popular Orthodox singer. This year the entertainer is Baruch Levine. Staffers practice some deference when it comes to asking visitors to remove hats and yarmulkes on rides - though only an act of God could save one’s head-covering from flying off on rides like Kingda Ka, a roller coaster that goes from zero to 128 miles per hour in 3.5 seconds.